This is another in a series of "blogicles" on how Mess Mapping™ and Resolution Scenario Mapping processes can be used to represent, analyze, evaluate Wicked Problems and then to choose actions that ameliorate the Wicked Problem at hand. Endstates are useful tools for considering how to resolve a given Wicked Problem. They do not represent forecasts or the facilitator’s opinions regarding the most likely or most desirable outcomes. Workshop participants commonly say that the Endstate they think is really most desirable is a combination of elements from 2 or more Endstates. 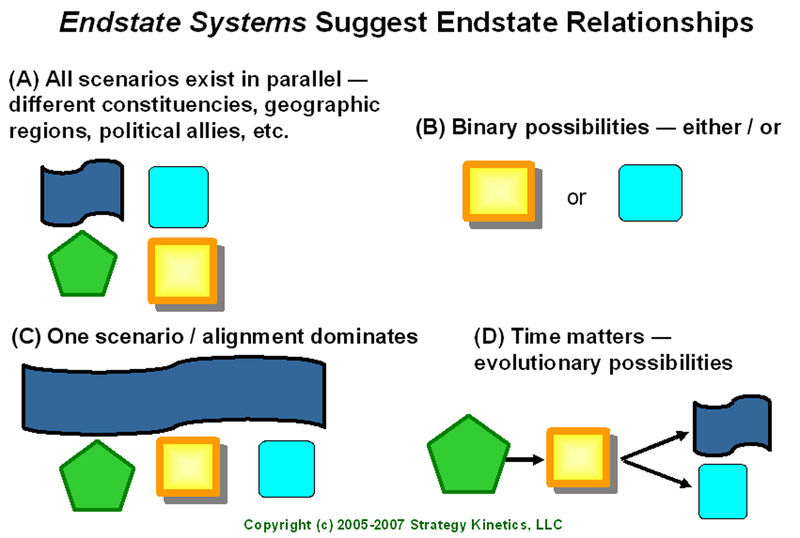 Consequently, we ask participants to consider how Endstates may be related to each other, that is, to create an Endstate System. Each of the four diagrams in the graphic below are abstract portrayals of ideas that have emerged from this workshop exercise. Each individual shape represents a different Endstate. (A) Perhaps the Endstates might exist in parallel, but characterize different geographic regions, political alliances, markets, economic sectors, states, etc. (B) Alternatively, workshop participants might conclude that either it will be one or another Endstate and that the others will not matter. (C) Yet another possibility is that one of the Endstates is really key and it will dominate the others. (D) Lastly, in this small set of examples, the relationships may change over time. Some Endstates will matter sooner while others will matter later. The bottom right example suggests that down the road there will be a major choice or fork in the road. Endstate systems provide another, more holistic way to take into account the beliefs of workshop participants. In turn, this analysis can be the input to a set of workshop tasks concerning key events, actions, and responsibilities.